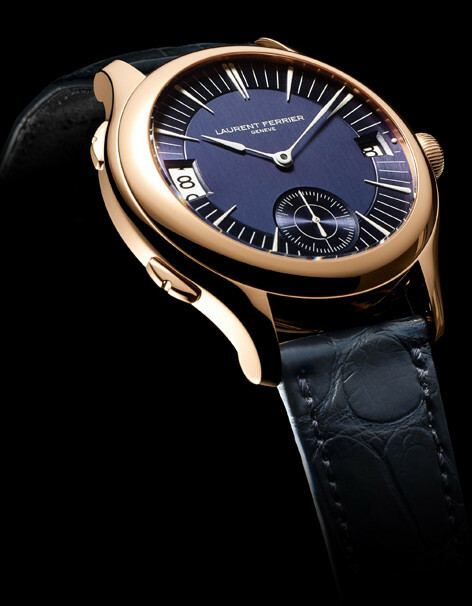 Once again I’ve chosen a watch model that represents not only a traditional elegance but also a masterpiece of Swiss watchmaking, the Laurent Ferrier Geneve Galet Traveller. This first appeared back in 2013 but as so often the case with true elegance models, is still as relevant today as it will be in 100 years. 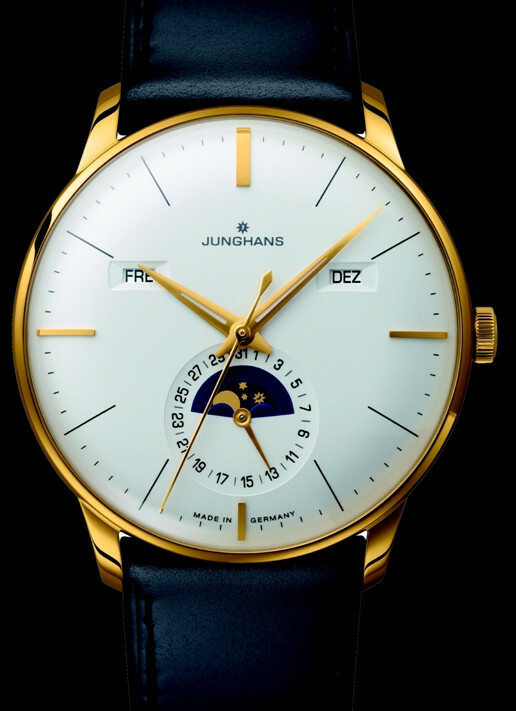 This particular model is quite unique in it’s approach to dual or world time and use an interesting complication which at the same time is very simple to use. A single press using one of the two oblong push buttons on the left side of the case move the central hand forwards + or backwards -. At the same time the Date @3 automatically changes at midnight, to reflect your new setting, and the subtle 24hr Date @9 shows your true Home Time day and position. Something a little different today as I feature a watch for the Ladies. And not just any ordinary watch as this is the Christophe Claret Margot “he loves me, he loves me not” creation, which whilst perhaps a bit of fun is a serious feat of watch making nevertheless. Based on the old concept of young love, where the petals of a daisy are plucked one by one in a bid to find out if her beau truly loves her after all, this amazing Christoph Claret complication is beautifully made, very attractive and charming too. Using the pusher @2, a crystal clear sound is heard and the watch starts to hide one or perhaps two petals and each press of the pusher removes petals as it computes it’s decision and after a short time delivers it’s verdict on the retrograde disc windows at the foot of the Mother of Pearl dial. The gold tipped steel hour and minute hands glide over the 12 white, satin-lacquered titanium multi-layered petals that surround the central yellow sapphire pistil accentuates the 3 dimensional effect. 3 pears shaped diamonds feature at 3, 6 and 9 o’clock. The chime (a feature of Christophe Claret) is visible via a case band window @8 where the ruby set hammer can be seen striking the cathedral gong above – an automaton feature I particularly like. The watch case is in Gold of course and has a curved profile which suits slim wrists and the crown is actually @12 but cleverly concealed behind the front decoration between the top lugs. 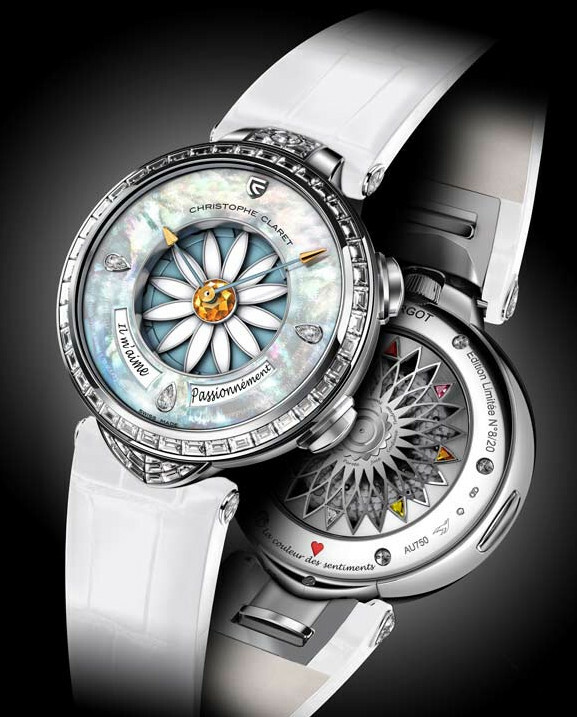 Even the rear of this watch features not only the intricate view of the mechanism but also continues the theme with a flower shaped carousel of 8 different colored triangular precious stones symbolizing sentiments of love – when the daisy movement stops, one of those will be associated with and opposite to the small heart @6. To see the watch in action click the following link – It should load and video controls will be available – best viewed full screen. 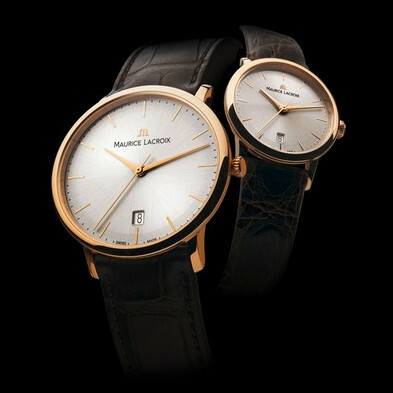 Three elegant offerings this week, starting with the 4 model Maurice Lacroix18ct Rose Gold ultra thins. With delicately curved Sapphire Crystal and simply elegant dials these Automatic models are just what they are – beautiful timepieces and very classic. 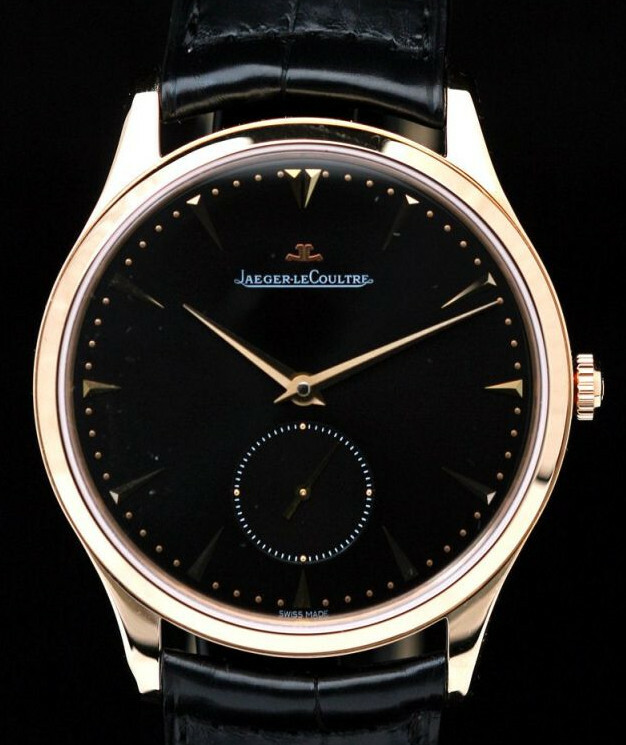 Not to be outdone Jaeger Le-Coultre have this addition to the well known Ultra Thin Master Grande with this time round a black dial and either in steel or Rose Gold. In these days of black divers and luminous requirements these dress watches are rather refreshing to see, especially when produced by these flawless quality makers. 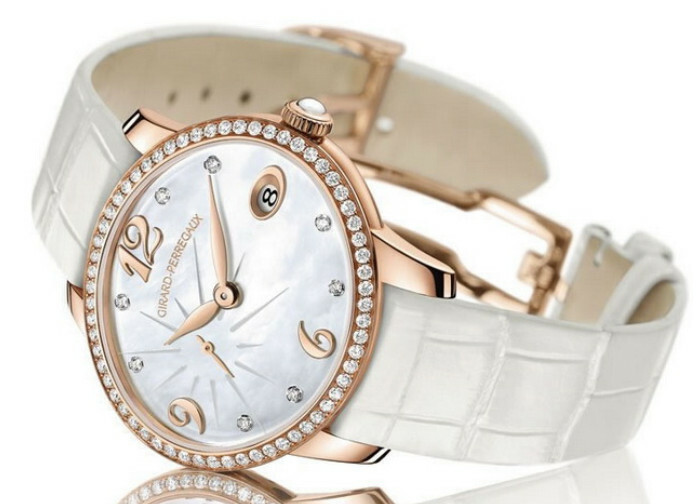 Not to be outdone there are of course the Ladies to cater for and here the new Girard-Perregaux Cat’s Eye Small Second Watch is about as elegant as you can get. 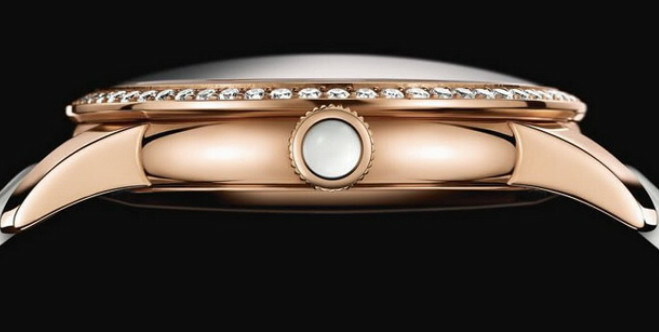 The sheer sensuality of this model with it’s slender curves and oval gold case and wonderful subtlety of Mother of Pearl (I’ve always loved this on watches). This is a 40mm diameter Double Date aperture @12 Date watch with a retro Day indicator @6. Sweet face in optional colors such as silver, blue or black and the 50m Water resistant case is either stainless or pink gold. with a sapphire crystal. Looks like a mechanical model but actually is powered by a Swiss quartz Ronda 7003L movement. This is a very easy to read model and certainly a dress watch that not many of your friends will know – but they’ll love it when they see it! 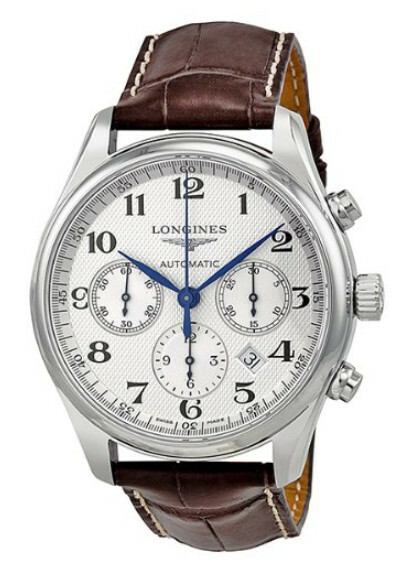 My second is an automatic mechanical Swiss Longines Master chronograph model L27594783 from 2011 and you can’t get much more classically elegant than this one. A 42mm diameter case, 30m Water Resistance, sapphire crystal plus a neat Date window between 4 and 5 plus a deployment leather strap – there’s always something about Longines that just shouts quality and style and never disappoints. 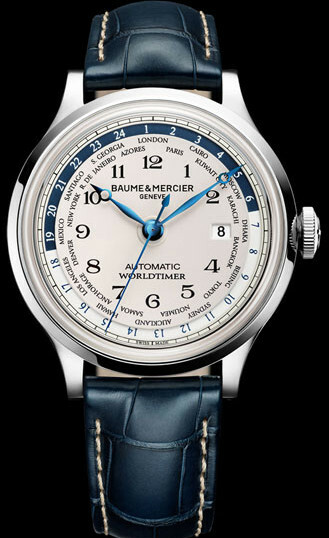 Third elegant offering is the Baume & Mercier Capeland World Timer. 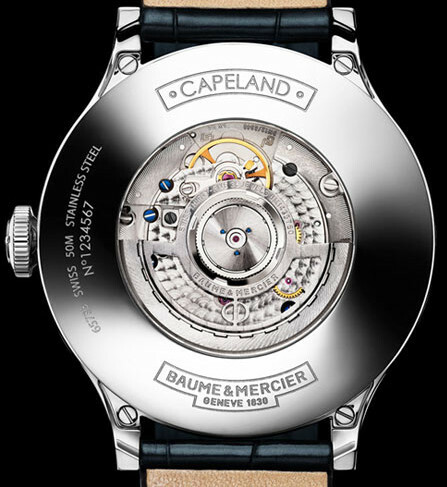 Lovely Swiss automatic mechanical movement in an elegant 18ct case at 44mm and featuring direct reading of 24 cities under a sapphire crystal. Blue hour and minute hands matched by the blue World Time ring and the blue of the high quality leather strap. To show the local time you select the name of the city matching your time zone then rotate the 24-hour ring to make the number representing the current time, face the city. You then move the hands using the crown. Even the back of this model has an elegance and through the exhibition back you can see the automatics at work. So another three genuine classics almost you could say and probably no surprise that they are all Swiss, as I think it fair to say that classical and elegance are watchwords for many of these makers. Whilst they give that almost old worldly look they in fact do feature subtle functionality often within their elegant looks and not so much “in your face” as so often the case with mainstream watches. Whether mechanical or quartz these watch brands seem to take a much more traditional account of the exterior appearance of their creations and that certainly works for me. Another look at those “elegant” models that we are so lucky to have around these days. 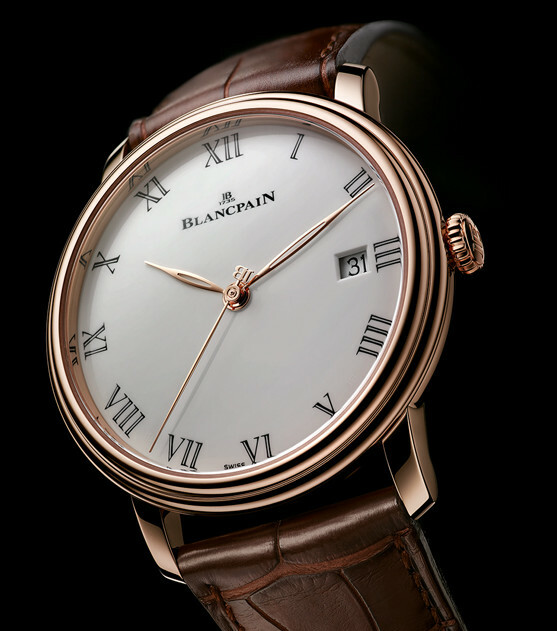 Here is one of my favorites – the Blancpain Villeret Répetition Minutes. Surely one of the most elegant watches that you not only can see, but hear! Born from a need to know the time many years ago in the dark without light when luminous hands simply did not exist. Trials of a “touchable” watch with exterior hands and minute graduations was never going to be the answer as they were too easily moved by accident. And so “sound” was the key. The Minute Repeater is probably one of the most complicated watch movements even today and there are not too many of them around. A slide on the side of the watch is moved and a chime sounds the Hours, Quarter Hours and Minutes – so much more artistic than luminous paint and with a discrete elegance that’s quite personal I think. To find one today that has the purity of sound and the incredible exactitude of transforming the exact time with the applicable sound is a feat of watch intricacy that is extremely hard to achieve. This model features the calibre 35 which has 2 hammers @3. 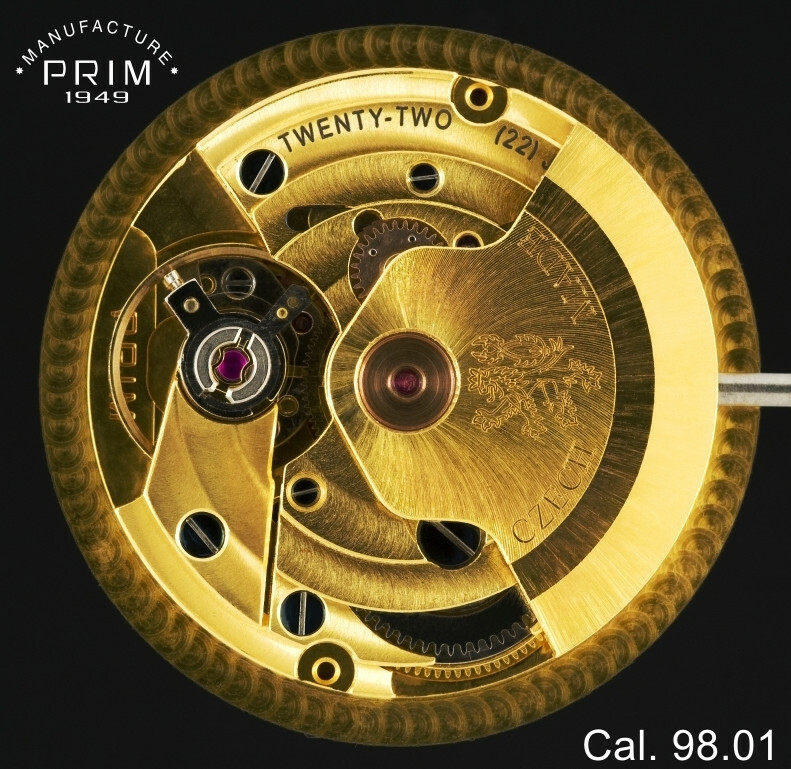 These strike against little “sounding rings” on the outer circumference and features 35 jewels in the movement. Next up is this brand that I would not have normally have associated with the word elegance. This is the Suunto Gambit 2 – an all in GPS, Weather Station, Time, Distance, Altitude – you name it and perfect for all you runners, trekkers and bikers and so on out there just raring to go. 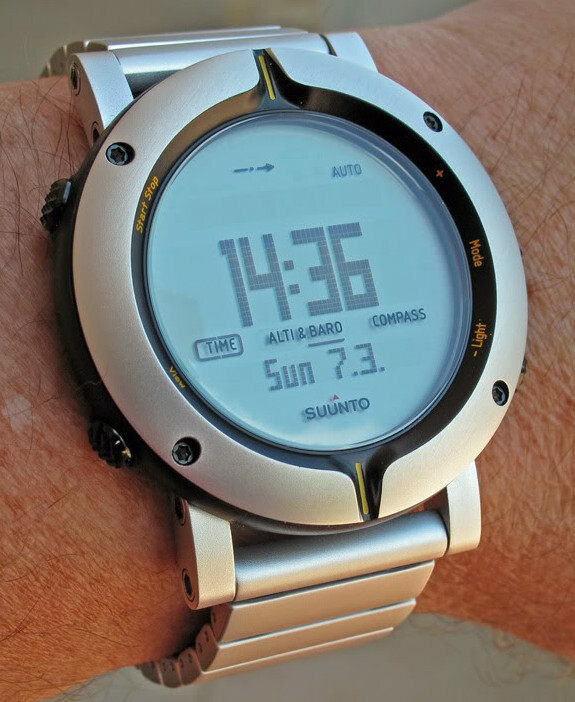 The Suunto Gamit2 a position of elegance? But for one in this particular guise it is really rather superb to look at too. Perhaps a bit big for me at 50mm x 17.5mm – but I feel I have to add this in to the “elegant” category I really do. And then something perhaps unexpected in the shape of the Timex Easy Reader – Why? I suppose it’s because of it’s utter simplicity and purity of form and function, this model has an elegance all of it’s own. Forget all those digital “hard to read” over functioned monsters hanging on to wrists that simply are not big enough to handle them and look sensible – THIS is a bring you down to earth reality check. 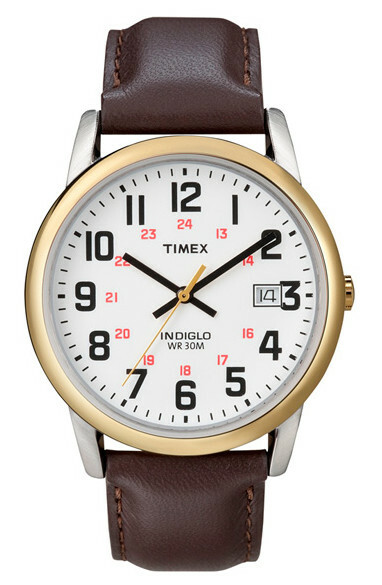 This watch does exactly what it says on the tin! 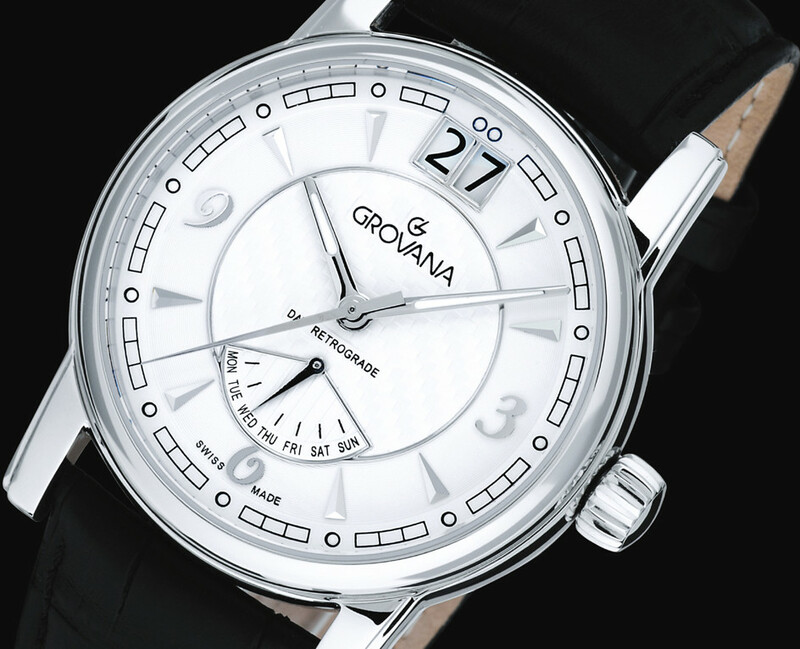 Great dial, great numerals, even a 24 hour clock set and a clear date. 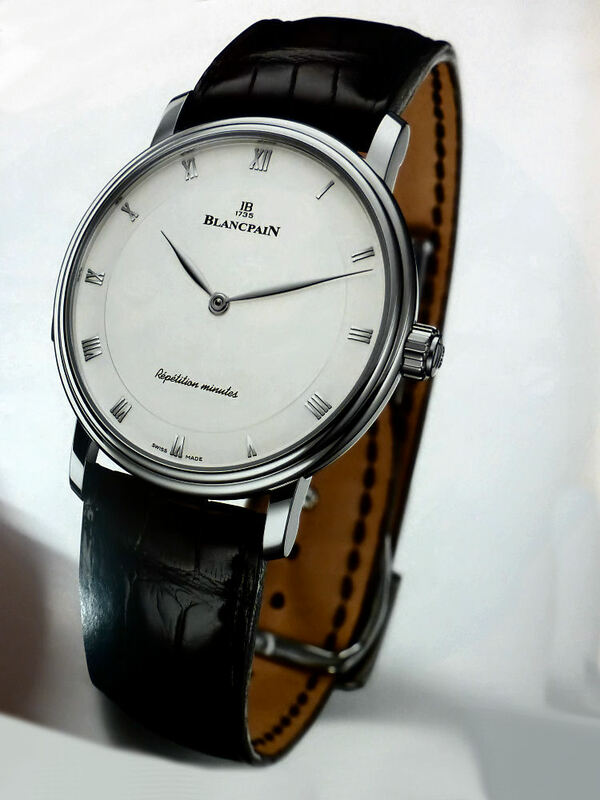 Centre second hand and excellent clear hour and minute hands. For night use “Indiglo” of course. Nothing more and nothing less than a “watch” and there’s such a natural elegance in that. The very elegant De Witt – what can I say – except that it’s not quite as simple as your average watch. From one “easy reader” to another – in the form of this beautiful “jump” disc watch. This model is just 40mm in diameter and in 18ct Rose Gold and is powered by a manual wind movement with a 42-hour power reserve. The 21-jewel fully decorated movement operates at a frequency of 28,800 vibrations per hour is also visible via an exhibition back. There is another color I understand and both look very elegant indeed. So without doubt there are some very elegant watches around and most are really beautiful designs too. They don’t have to complicated either – take the Timex easy Reader for example, but can have a purity of form and function that has an elegance of their own and rightly so. It is also a fact that you don’t have to necessarily spend a fortune to find an elegant watch, though it is I contend somewhat easier, as design has so much to do with elegance. Anyway what will I find next week? Difficult to tell, though I might just include another of my own collection and see if you agree. My third outing of “The elegant Watch” feature, showing watches I would consider could meet that description. Starting with the Ralph Lauren “Sporting” model with it’s IWC Cal.RL98295 mechanical manual wind movement. The well constructed Stainless steel case and matching bracelet and general look of the piece I find rather pleasing. It features a seconds sub-dial @6, convex Sapphire Crystal with internal and external colorless anti-reflective coatings. 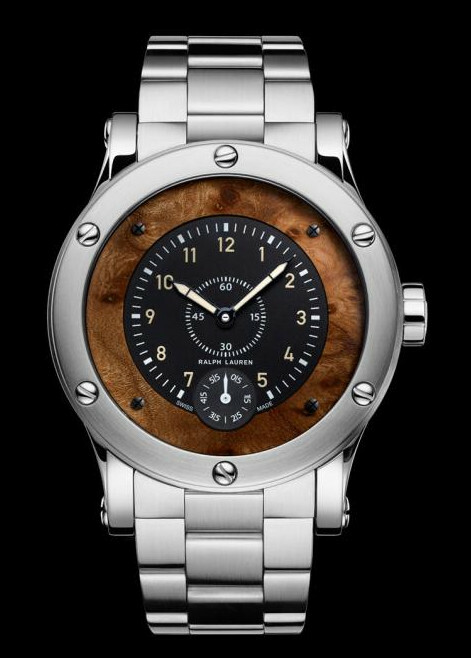 The dial is unusual with a black matte galvanic center, brown elm burr wood outer (fixed with 4 screws), Arabic beige colored numerals and white hands, each with luminescence. At just over 44mm diameter it is a substantial watch and yet still manages to look elegant. 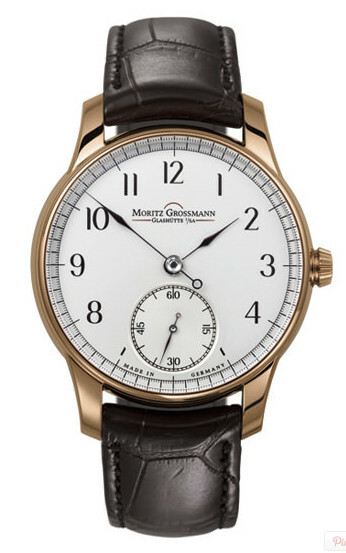 Another very stylish watch but from Germany is this lovely Limited Edition BENU by Moritz Grossmann. 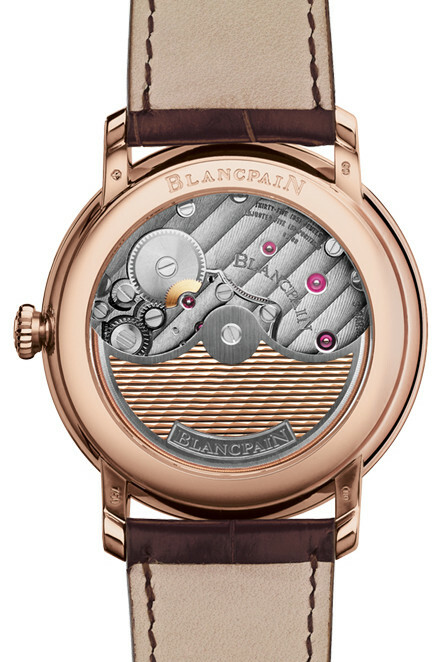 This model in Rose gold equipped with a manually wound movement adjusted in five positions. Hours, minutes and seconds, 42-hour power reserve, solid silver dial, Arabic numerals, sapphire crystal with anti reflective coating, hand-crafted steel hands with brown/violet hue, hand-stitched alligator strap and limited to 100 watches worldwide. Not to be outdone in the “elegance” stakes this next model shows that not all elegant watches have to be gold or classically shaped. This is the v-tec Gamma designed by Michel Huber. A highly interesting design from the orginal Ventura square model back in the 1990’s. The watch dimensions are 41.85mm x 36.50 in a hardened Durinox® case. Sapphire crystal, multifunction VEN_10 digital module (backlit LED display), 50 metres Water Resistance and orange rubber strap with adjustable folding buckle. 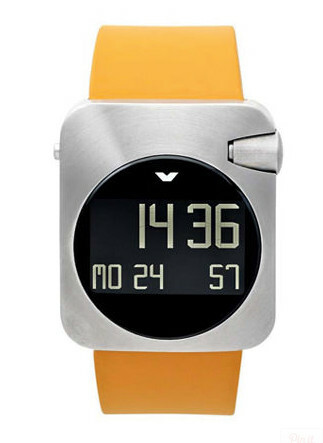 The brushed case finish and orange/yellow strap with the black face really set this off and for me it has a definite modern elegance. Last and certainly not least is the wonderful (and expensive) Jaquet Droz 6553L2, Self winding mechanical, double barrel, retrograde moon phase with 22ct white Gold rotor. Bit of a mouthful I know, but what a stunning watch. 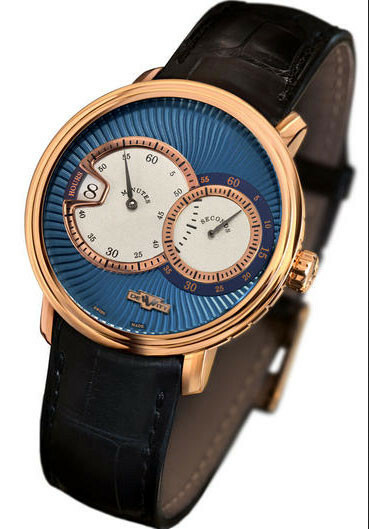 28 days reserve, 28 jewels in an 18ct red gold, 39mm diameter 12.7mm height case, with 3 bar WR or 30 metres. 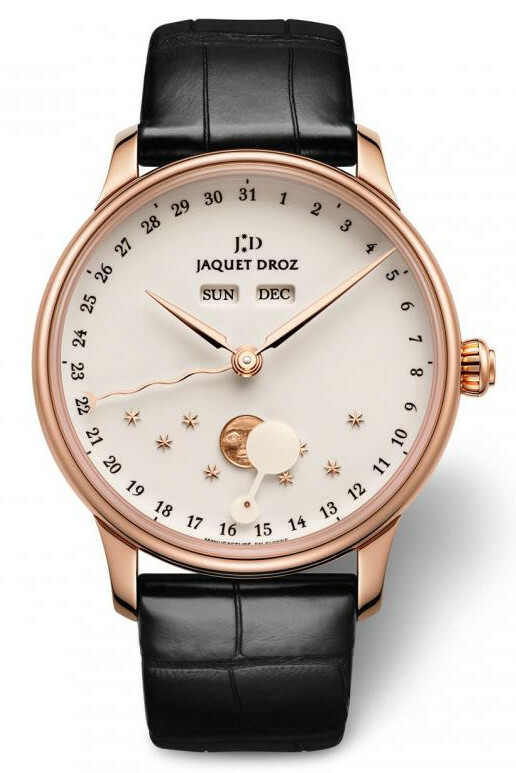 Jaquet Droz – who else? The dial features Triple Date Calendar complications on an Ivory Grand Feu enamel with 18ct gold applications plus moon phase and 18ct gold hands including the strap buckle. Yes this is one very highly specified watch from one of my very favorite watchmakers. For me this is simply a delight and elegance in the extreme – if only I could afford one of these, then I’d happily reduce my collection down to far less models but much more of this quality. 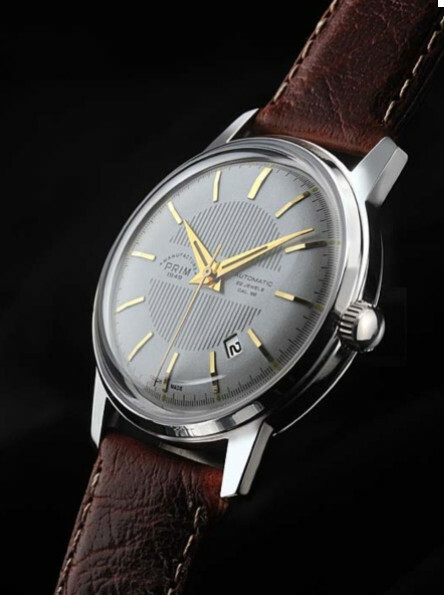 So another four “elegant” models for you to consider and I’m already looking forward to the next Elegant watch post . . . .
Another collection of “elegant” watches from around the world. 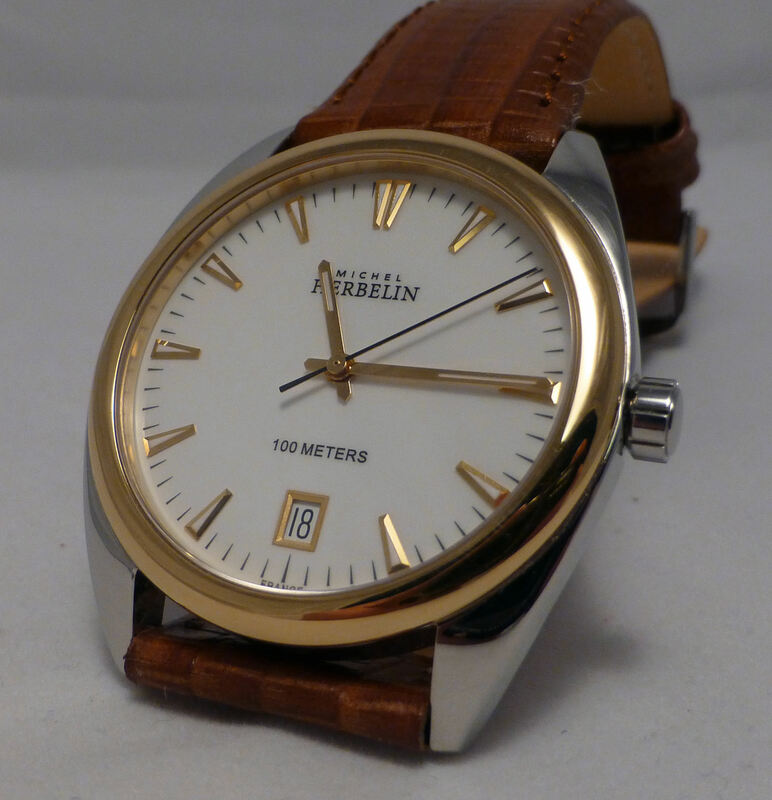 First from my own cabinet is this, now vintage, made in France, Michel Herbelin Classic with a Swiss ETA movement. Michel Herbelin Classic Swiss ETA quartz, sapphire crystal, 100m WR. 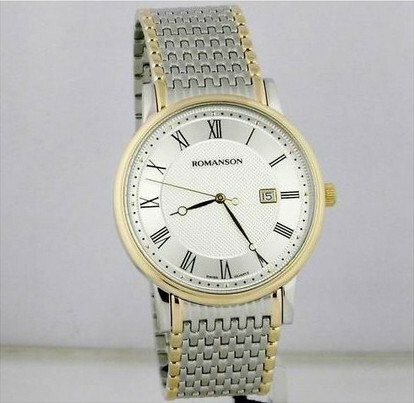 Followed by a delicate but classic form of the Romanson of Korea model, not often seen here in the UK, but nevertheless a popular watch around the world. This model certainly has an elegance and worthy of including here. I particularly like the perfectly matching bracelet which also has a delicacy of form I find very pleasing. 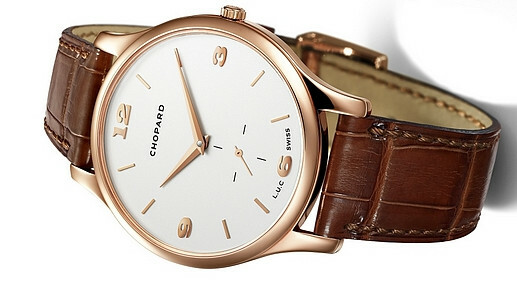 From the £300 range we move upwards to the classic Swiss Chopard Luc XP Automatic 65hr reserve with micro-rotor. What sets this apart is the beautiful formed case at 39.5mm which is delicately thin 7.3mm. 18ct of course and powered by the use of a superb micro-rotor. 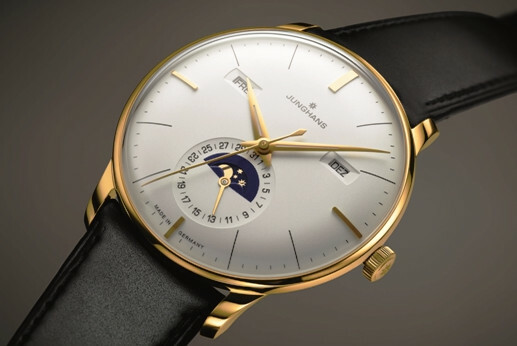 Now off to Germany for this wonderfully elegant Junghans Meister Kalender model. Featuring the automatic J800.3 mechanical movement, rhodium case and a convex hard Plexiglass with SICRALAN * coating which allows much better scratch resistance, excellent UV and chemical resistance. I love this Triple Date Calendar and Moon Phase model so much that I have included another image – surely one of the most refined Triples around at the moment. For such a lovely watch you would be forgiven if you thought it far out of reach price wise – however it may surprise you and could be worth checking it out! I spotted it at €2000 Euros just the other day. That surely has to be one of the best elegance to value ratio models I have seen in a long time. Elegant – simple enough word to say, but not quite so easy to see – I mean what’s elegant to me may not be to you and as a description of a watch, well it then becomes wide open to interpretation and even ambiguity, so say the least. What about “refined” or “sophisticated” or maybe “tasteful”. Perhaps “delicate” would describe it or even “graceful” and so on and on . . . . .
Not so easy is it? Can this definition actually be defined – Wow, that’s deep, but there lies the conundrum and can it be applied equally to a Dress watch or an everyday Practical watch? 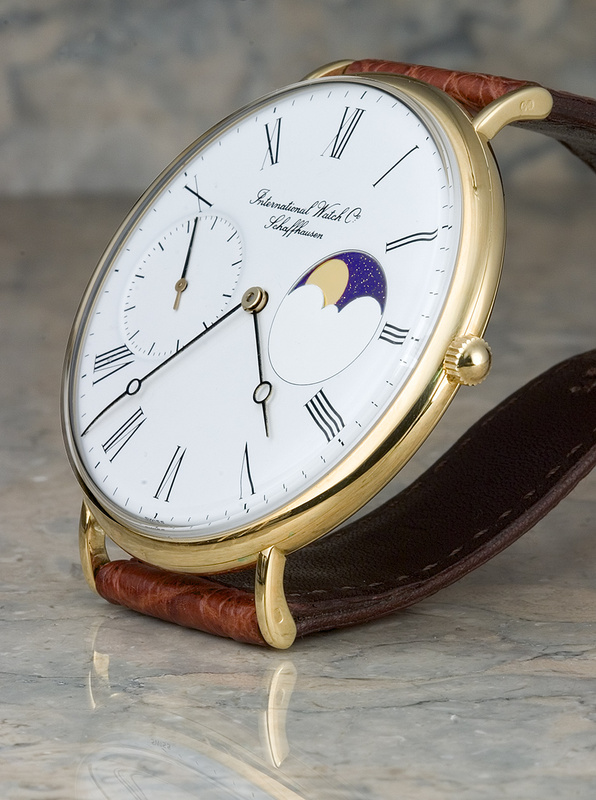 The beautifully elegant IWC Portofino Moonphase. Perhaps what I’d personally call “simply” elegant, the IWC Portofino – and yes “delicate” even “graceful” and certainly “sophisticated” – oh yes it ticks a good few boxes for me and if elegance is a combination of so many different impressions, it certainly fits the brief I’d say. 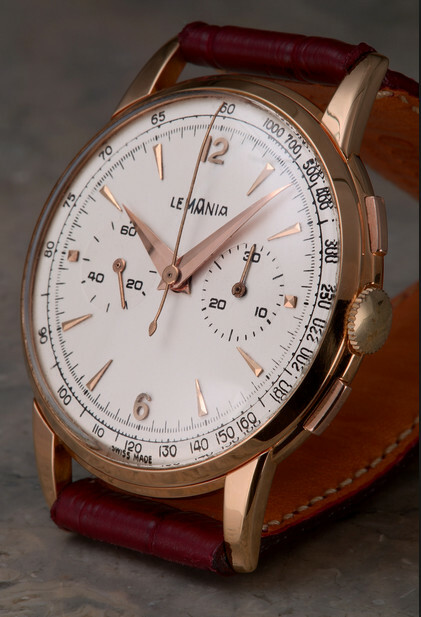 A beautiful 18ct Pink Gold cased Lemania (supplier to Brequet) from the ’50’s, with sunken engraved sub-dials at 38mm diameter and only 8.5mm depth, is indeed rather slim and elegant. Proportionally it is a very pleasing watch and one that I think meets the criteria pretty well. Not sure if this Ebel automatic 9303F61 is entirely “elegant”, but it has a certain “refinement” about it that I personally like. Definitely “sophisticated” and even complicated showing the Day and Date in retrograde style and all contained in what they call their Classic Hexagon model – 45.4mm diameter x 11mm. I love the description of this particular dial configuration which is called the “wink and smile”. 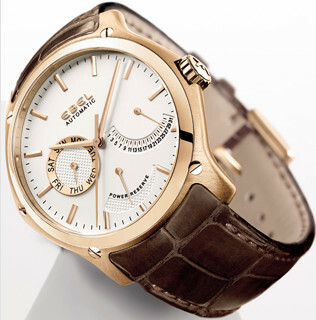 Ebel tend to be a little below the radar here in the UK, but they do produce some very sweet and very high quality watches, which is unsurprising as Movado group are involved, so need I say more. Followed by a Seiko GS automatic, just to show that Gold doesn’t have the monopoly on elegance. 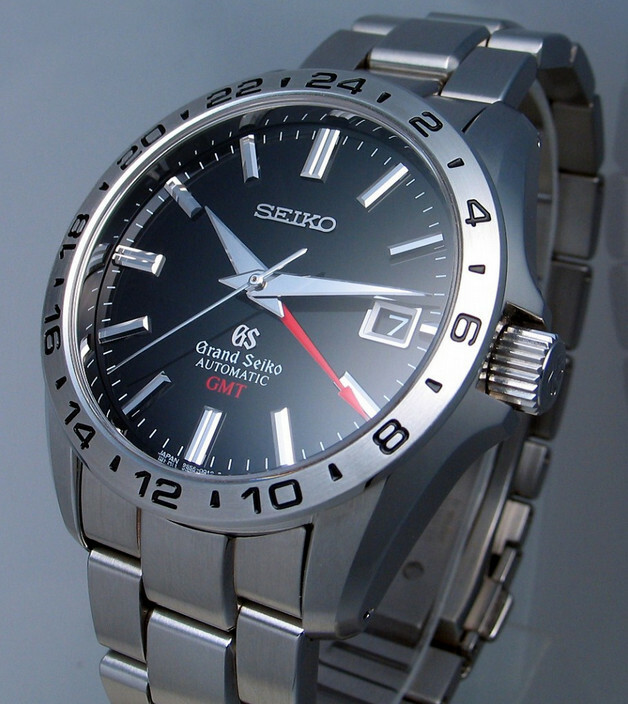 Seiko are masters of stainless steel design and this model is no exception. Beautiful shaped curve of the GS and it’s balance between refinement and practicality, the perfect matching bracelet says it all and i think a worthy member of my “elegant” selection. Note – Another 4 watches will feature next month on or around the same time, same place . . . . . .